The Economic Partnership Agreement (EPA) negotiated with Japan is an important step towards trade liberalisation. Though it is not a 'free trade agreement' — and was never going to be — real benefits will flow across a range of Australian agricultural exports, including dairy products and beef. At the same time, predictions of instant windfalls should be treated with caution. The tariff reductions on beef, for instance, will not be fully implemented for between 15 and 18 years, by which time the new tariff rates of 19.5 per cent (for frozen beef used in processed food) and 23.5 per cent (for chilled beef sold at supermarkets) will be about the same as China's average tariff on agricultural imports today. Following years of discussions, progress towards a deal accelerated after Japan's change of government 16 months ago. A key element of Prime Minister Shinzo Abe's revitalisation plan for the Japanese economy is deregulation, and pressure has been building for him to deliver something concrete to consumers who have just been hit by a rise in the consumption tax rate. Japanese officials are hoping the EPA with Australia — Japan's first with a major agricultural exporting nation — will help clear the roadblock holding up a Trans-Pacific Partnership (TPP) agreement. As Tony and Shinzo (they addressed each other by their first names) were shaking on the deal, a short distance away in Tokyo Japanese and American officials met for another inconclusive round of TPP negotiations. While there was no repetition of the 'best friends' reference in Abbott's public comments, the two leaders made much of their nations' long history of commercial engagement and shared commitment to 'democracy, freedom and rule of law'. The relationship, said Abbott, was not just based on commerce: 'It's about respect; it's about values'. 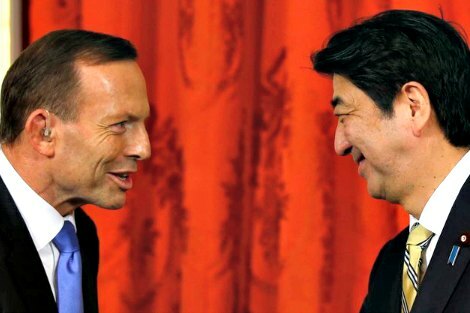 For his part, Abe talked about forging a 'special relationship' with Australia. Their ideological handshake can hardly be seen other than as an expression of what separates them from non-believers (read 'China'). Indeed, while trade dominated the headlines, another important theme of the visit was strategic cooperation. Abbott was afforded the privilege of being the first foreign leader to sit in on a meeting of Japan's new National Security Council. The two leaders reportedly discussed possible exchange of defence technology and joint weapons development. Recently Abe announced the easing of a long-standing ban on weapons exports, which might now directly benefit Australia. Abbott also indicated his approval for the Abe government's reinterpretation of Japan's 'pacifist' constitution to include the right to collective defence. Prior to this Japanese participation in international military operations has been 'exceptional', strictly non-combatant and for peace-keeping purposes only. Absent was any direct rebuke for the hawkish words and deeds of Japan's conservative leadership that have inflamed opinion in China and South Korea; contentious historical issues were swept aside in Abbott's 'look to the future' and 'don't stir up trouble' formula. Two recent episodes can be cited as bearing on the leaders' talk of 'shared values' and 'respect'. One is Japan's swift acceptance of the whaling decision by the International Court of Justice, a ruling Tokyo felt deeply and did not anticipate. Though it took a large swallow of pride to submit, it was done with an eye to Japan's territorial dispute with China, which Tokyo says must also be governed by international law. The other episode occurred off the coast of Western Australia when a Chinese vessel picked up a possible signal from the 'black box' of the missing Malaysian airliner and chose to inform head office in Beijing rather than alert the Australian search coordination centre. Retired air chief marshal Angus Houston, in charge of the overall operation, was unimpressed, pointedly referring to China undertaking its 'own investigations'. These are no more than dabs of colour on the larger diplomatic canvas, but mood and perception are important nonetheless. For now it is not a matter of Australia choosing between Japan and China, of closer relations with one implying strained relations with the other. Or it ought not to be. Articulating that distinction will be tricky for Abbott in Beijing. For all the gains of the first leg of his journey, much more could be lost if he stumbles on the last leg. Appearances suggest he is not a natural diplomat at ease amid the pomp and ceremony of unfamiliar cultures. He'll get plenty more in China of the courtesies he received in Japan (contrary to some reports, he was not afforded special treatment there beyond what is usual for an official visit). At this moment in history the two powers in Asia on whom our economy and security greatly depend have reached an impasse. That should not constrain Australia from reaching out to both on the basis of mutual interest, in the first instance, and, where possible, on the basis of shared values. China has a keen appreciation of the former and, for reasons that any student of history should understand, an abiding suspicion of appeals to the latter. Clearly distinguishing one from the other, and acting accordingly, is Abbott's immediate challenge if he is to pass this early test of his statecraft. Walter Hamilton reported from North-East Asia for the ABC for 11 years. A good thoughtful article ruined by the editors bias . Nothing in the detail expands on the editors assertion that this is a jaunt , quite the opposite . This is a very serious trade mission critical to our future . Editor , Abbott won the vote of the people , get over it and get relevant again . The bias is ruining a great organisation . Good point; they should have called it a Royal Progress! Rubbish to Old G and to the author. We in the real world of the hard slog that is the meat industry greatly appreciate the progress. Nonsense and negativity by spectators who do no heavy lifting are unwarranted.